There were plenty of surprises in the life of Oscar Cahén, the much-admired artist. As a newcomer from Europe he surprised the Toronto art community by the way he developed as a painter — developed so well that he helped lead Painters Eleven, the rebellious Toronto group that brought the exuberance of abstract art to Canada in the 1950s. He also surprised the professionals when his talent for magazine illustration quickly made him the star contributor to Maclean’s magazine. Light-hearted illustration became his day job, supporting his more adventurous painting. But the biggest surprise in his life was the time when Britain arrested him as an “enemy alien” and imprisoned him. It was a bureaucratic mistake from which he and many others suffered. It was also one of the more bizarre incidents in Canadian history. To read the entire article, please open the PDF listed below. 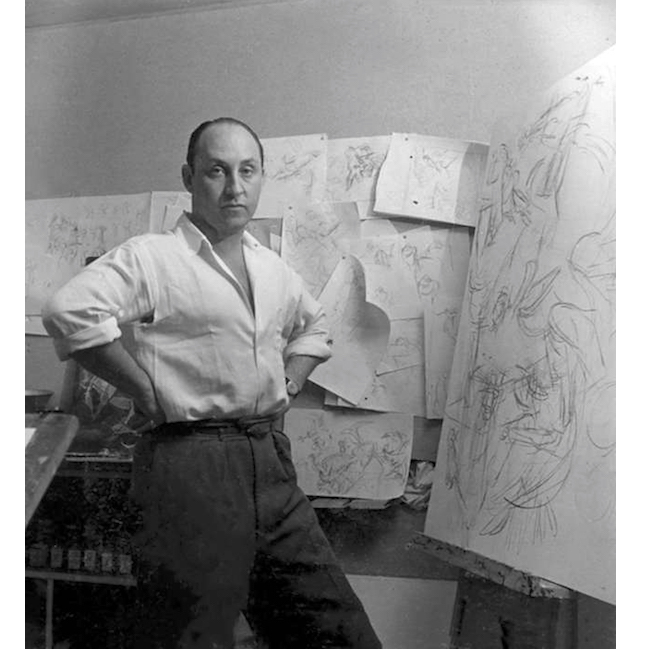 Portrait of Oscar Cahén in his studio in 1951. Photograph by Page Toles.